All this blogging is quite unusual for me! Not long ago I was interviewed by the Encyclopaedia Britannica Blog folks so an article could be produced. It also reviews my recent book Digitized. I quite enjoyed these questions - a little different from the norm. You can read the article here. I was asked a few weeks ago to write an article for the US Oxford's OUPblog. They're running a sequence of entries from authors about Turing to celebrate 100 years since Alan Turing was born. Having written Digitized recently, which includes the stories of many pioneers of computing, not just Turing, I thought it might be fun to illustrate some of the views of Turing's contemporaries. So I wrote this slightly controversial blog entry for them... Enjoy! 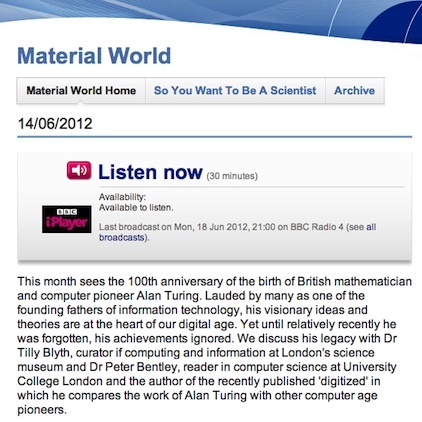 Material World is a BBC Radio 4 science show hosted by Quentin Cooper that features interviews with various scientists. This week it was my turn, appearing with the curator of a new turing exhibit in the Science Museum. We had a ten minute slot (quite a long time in radio land) where we spoke live on air. You can hear what we had to say by clicking here. It's not so new, but it's only just come to my attention - another nice review of my book Digitized on The Generalist blog. Many thanks! There's also another review in the New York Journal of Books.